There was hope that Howard Davies’ airports commission report would resolve the issue of where to site a new runway in the South East, but the hope was swiftly ended almost as soon as the report was released. With no conclusive decision made, as anyone who has seen the competing adverts on the ticket barriers of Westminster station will know, Heathrow and Gatwick remain locked in the struggle for where any new runway will go. David Cameron has set a target for making a decision on the airports commission recommendations by the end of the year. However, having been forced to wait over a decade already, London’s business leaders are sceptical of any promise of a swift resolution. ComRes research for the London Chamber of Commerce and Industry (LCCI) shows that almost half of London business decision makers (46%) think that the Government will delay making a decision on implementing the recommendations of the airports commission. They are more likely to anticipate a delay on this than on any of the other schemes tested. The political attraction of deferring the call is plain to see. David Cameron faces dissent from within his own party, including from both the current Mayor of London and his anointed successor. The Prime Minister also ruled out Heathrow expansion himself with “no ifs, no buts” in 2009. However, David Cameron is facing pressure from businesses and politicians not to duck the issue. 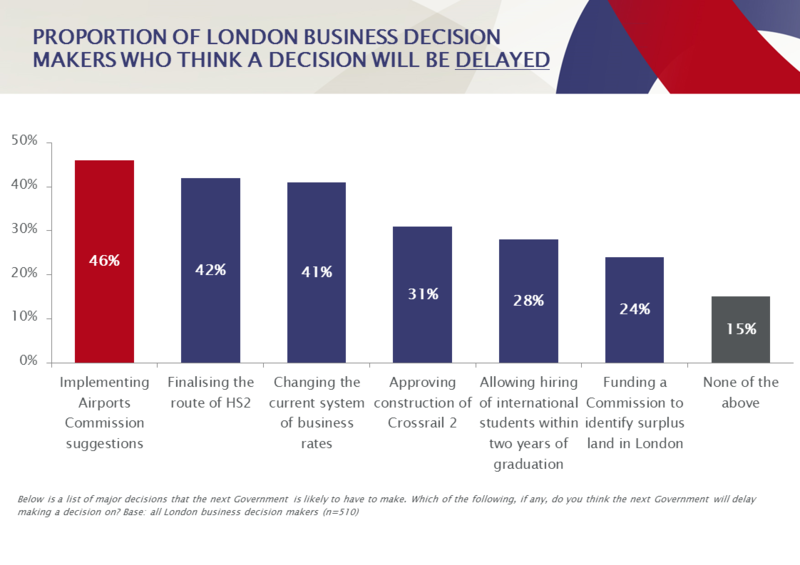 Making a decision is seen as important for the economic future of the UK, with seven in ten (71%) London business leaders saying that a delayed decision would have a negative impact on their business at least to some extent. This is not simply the perspective of the commercial world. Three quarters (77%) of MPs agreethat the UK risks being left behind competitively if a comprehensive plan to increase airport capacity is not adopted in the next 12 months. 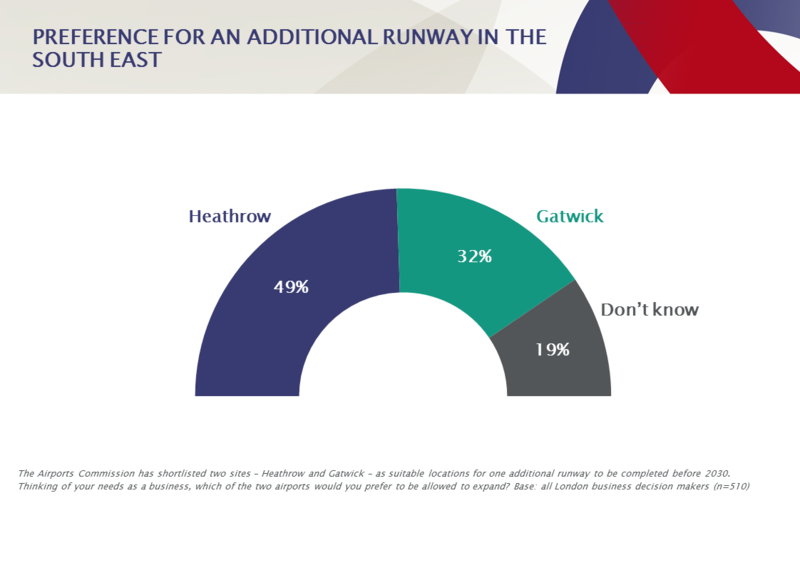 When it comes to a new runway in the South East, the preference among businesses in London is for Heathrow over Gatwick – 49% vs 32%. 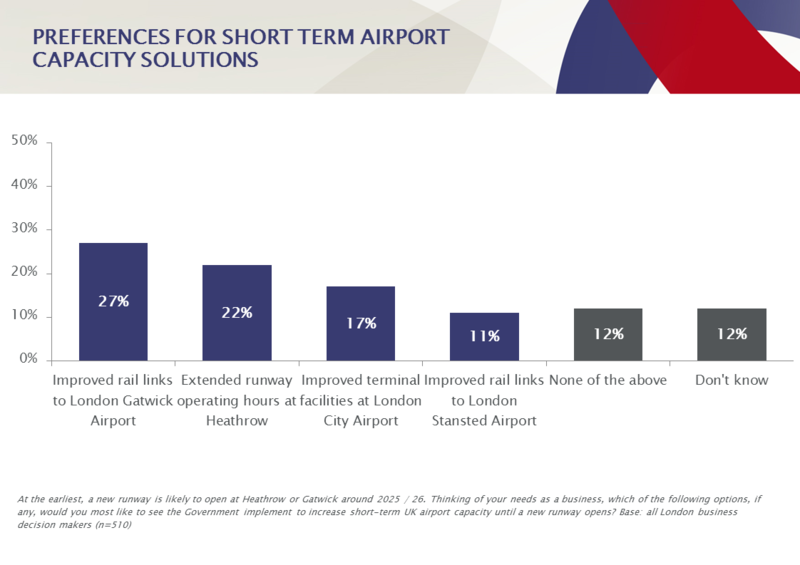 The picture among the public is more contentious, with both airports claiming greater support, although Heathrow currently leads the betting odds. And yet, a new runway will not start delivering capacity for at least 10 years at the earliest. If capacity is to increase during the interim, shorter-term measures will be required. These could include improving rail links, extending operating hours or upgrading terminals, all of which have a degree of support from the London business community. It remains to be seen if and when David Cameron will make a decision on a new runway. However, it is not just the top level decisions that can prove contentious. Little progress has been made on these shorter-term decisions either, and it is they which can help ease capacity issues in the coming years. It is clear that a decision on a new runway will have a major impact on the future of aviation in the South East. However, in this case it is not just the big decisions that matter, the little ones can add up too.